Recently, The Simpsons presented the 25th installment of their Treehouse of Horror series. Appearing annually around Halloween since the show's second season in 1990, each holiday special features three scary vignettes that find the residents of Springfield unwittingly living out abnormal and darkly funny original stories from the show's writers. Because these episodes are non-canon, the writers' imaginations really get to run wild. Here are some facts you may not have been aware of about the iconic series within the iconic series. EC Comics is best known for publishing early horror series Tales From the Crypt, science fiction anthologies like Weird Fantasy and Weird Science, and, above all else, for MAD Magazine. The outlandish but fun volumes of work were an influence in coming up with the first Treehouse of Horror, named for the treehouse that hosted Bart and Lisa's scary storytelling back-and-forth on that October 1990 night. "The idea of it to parody EC Comics was really original and kind of shocking for a cartoon on network television," executive producer Jim L. Brooks recalls. The classic Rod Serling sci-fi anthology series was another big early influence, and the twist at the end of The Twilight Zone's "To Serve Man" was the basis for the inaugural Treehouse of Horror's "Hungry are the Damned." "The Bart Zone," which was in black and white (and narrated by Harry Shearer doing a Serling impression), was a play on The Twilight Zone's "It's a Good Life," a 1961 episode where a six year old boy with mental powers terrorizes a small town. In Treehouse VI, "The Genesis Tub" was similar to Twilight Zone's "The Little People," a fact pointed out bySouth Park in their infamous "Simpsons Already Did It" episode. Other Twilight Zone episodes that got Simpson-ized include "Living Doll" ("Clown Without Pity"), "A Kind of Stopwatch" ("Stop the World, I Want to Goof Off"), "Little Girl Lost" ("Homer3"), "Nightmare at 20,000 Feet" ("Terror at 5½ Feet"), and even the 1980s New Twilight Zone episode "A Small Talent For War" (some of "The Monkey's Paw"). In Treehouse of Horror IV, Bart's introductory vignettes are an homage to Serling, who introduced the spooky stories in his 1970s horror anthology series Night Gallery. Because Treehouse of Horror was so out-there and perhaps shockingly different from normal Simpsons episodes, the writers had Marge break the fourth wall to warn parents before the start of the episode, lampooning the beginning of 1931's Frankenstein. There were funny little disclaimers opening the specials for the next couple of years, but according to then-staff writer and current showrunner Al Jean, speaking on the season three DVD commentary, the warnings became burdensome to write and were permanently forgotten about after the fifth installment. The voice of Darth Vader is still the only voice actor to play a character in all three installments of a single Simpsons Halloween special. Jones appeared as the moving man in "Bad Dream House," the narrator in "The Raven," and the alien chef Serak the Preparer in "Hungry are the Damned." For Serak, Jones chewed on a cookie close to his microphone in order to get the alien drooling sounds just right. Jones returned to voice alternate-universe Maggie in the 1994 Treehouse of Horror story "Time and Punishment." The two evil but easily distracted aliens are named after Star Trek characters. Kang was a Klingon captain in "Day of the Dove," and Kodos the Executioner was a bad guy in "The Conscience of the King." Their home planet of Rigel 7 is itself a planet from the Star Trek universe. Their streak of making at least the briefest of cameos in every Treehouse of Horror almost ended with the eighth edition before writer David X. Cohen convinced the producers to make a last-second change. 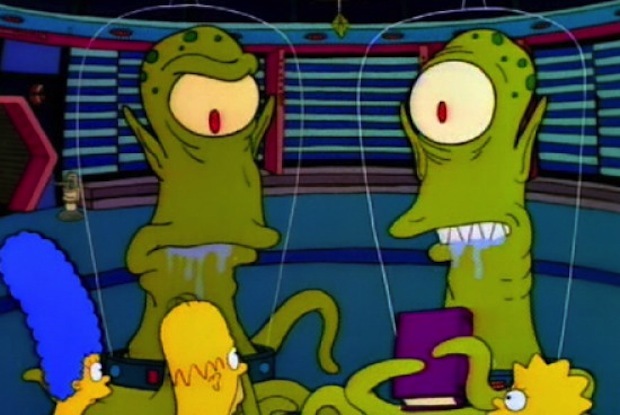 Sometimes the shoehorning of Kang and Kodos is made explicit, like in XII when they were tacked on in the epilogue, bemoaning that they were left out of the episode before agreeing to do Old Navy commercials. In other episodes they are responsible for driving the plot, like in VII's classic "Citizen Kang," when the two impersonated 1996 Presidential candidates Bill Clinton and Bob Dole. According to Jean in the season nine DVD commentary, it was executive producer Sam Simon's idea to stretch out episodes that were running short on time by elongating Kang and Kodos' maniacal laugh sessions. For the first few years, Treehouse of Horror opened with a quick trip to a graveyard memorializing random actual deceased people (e.g. R. Buckminster Fuller), and the passing of the likes of "I'm With Stupid," "American Workmanship," and "Subtle Political Satire." In Treehouse of Horror III, there were tombstones for Fish Police, the Steven Spielberg and Tim Burton-produced Family Dog, and the Steven Bochco co-created Capitol Critters, all of which were quickly canceled primetime animated shows that most dismissed as attempts by rival networks to try to capitalize on The Simpsons' success. The "Amusing Tombstones" tombstone in the open of V was the tip-off that the writing staff was finding it harder to come up with ideas for the gag. Simpsons creator Matt Groening confessed in a season six commentary track that another concern was that future failed TV shows would be helmed by ex-Simpsons writers, which of course would turn out to be the case. Season six showrunner David Mirkin tried his best to make that season's special as "disturbing" as possible in response to Congress's attempts to censor The Simpsons because of perceived excessive violence. This is why Groundskeeper Willie suffered the misfortune of taking a fatal axe to the back by Homer, Maggie, and Principal Skinner in all three segments of Treehouse of Horror V. Three years later, Mirkin got some pushback when he made his target more direct. Mirkin successfully pitched a show introduction of a Fox censor getting stabbed to death with a dagger. The actual network censors made them change it to a comically large cutlass. The 2006 "The Day the Earth Looked Stupid" vignette started with a parody on Orson Welles' "The War of the Worlds" radio broadcast. Everyone in Springfield except Lisa falls for the prank, believing that aliens have truly invaded, and don't believe when Kang and Kodos really do invade Springfield. Three years later, with the town in ruins, the two aliens wonder out loud why they weren't greeted as liberators in their "Operation: Enduring Occupation," an obvious reference to the U.S. occupation of Iraq. In the version sent to TV critics before its broadcast, Kang got the last line of the scene: "This sure is a lot like Iraq will be." Even though Fox was okay with it, Al Jean eventually listened to the writers who objected to the obvious joke and cut the line from the final version. When Homer's soul is in legal limbo in Treehouse of Horror IV's classic "The Devil and Homer Simpson," he is given the ironic punishment treatment in Hell and is force-fed all the donuts in the world—a fate Homer enjoys. The famous scene is a parody of the 1937 Merrie Melodies cartoon Pigs is Pigs, where the gluttonous Piggy Hamhock (not Porky Pig) is captured by an evil scientist and is forced to eat an ungodly amount of food. Spoiler: it was all a nightmare from Piggy Hamhock's mind, but it marked Piggy's final appearance on film. The 2001 segment "Wiz Kids" was a parody of Harry Potter and the Sorcerer's Stone, the first book of the Harry Potter series. According to Simpsons writer Carolyne Omine on the season 13 commentary, pitching a Harry Potter story was a "hard sell" because only "about four" of the writers on staff had read it. They went ahead with it, and the movie version of Sorcerer's Stone would premiere 12 days after 2001's Treehouse. In a deleted scene, one of the alternate universes created by Homer's magical toaster in "Time and Punishment" unveiled a teenage son named Roy. In the season six commentary, Matt Groening said that "somebody from outside of the show" suggested the idea of Roy. The writers never forgot it, and when Fox executives suggested before season eight that The Simpsons add a new character, the backwards cap wearing, shades-rocking "cool" kid made his debut in "The Itchy & Scratchy & Poochie Show," a meta episode about an established TV show adding a hip, new character in a desperate attempt at ratings glory. Roy only had two lines and never came back, whereas Poochie made a brief return in Treehouse of Horror IX's "Death of the Tiny Toon." Even though he created The Simpsons, Matt Groening didn't understand all of the jokes on his own show. He admitted on the season six DVD commentary that he had never seen The Shining, and all of the jokes and references in Treehouse of Horror V's "The Shinning" were "entirely lost on him." Groening was able to understand "The HΩmega Man" in Treehouse of Horror VIII enough to designate Comic Book Guy's line, "Oohh, I've wasted my life..." before he died from a nuclear bomb blast as his favorite line of the entire series. 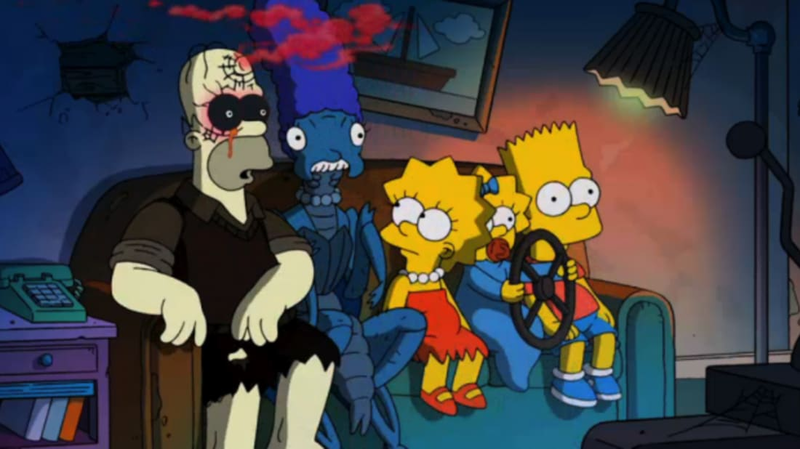 Previous Simpsons showrunners have expressed how difficult writing Treehouse of Horrors can be compared to normal episodes. David Mirkin recalled, "Things had to happen really fast. They're really just crammed with jokes and story beats and everything." Co-showrunners Bill Oakley and Josh Weinstein, on the season seven commentary, said, "All three of these segments are very complex stories...it's hard to fit three complete stories into 21 minutes." After a poorly received screening, almost 100 line changes were made to Treehouse of Horror III—which featured "Clown Without Pity," "King Homer," and "Dial 'Z' For Zombies"—in the six weeks between the arrival of the animation from Korea and the show's air date. The difficulties almost caused the canceling of the Treehouse of Horror series before it could become an institution. Before the dramatic self-editing took place, Al Jean and fellow executive producer Mike Reiss contemplated junking the Halloween specials entirely, but were overruled.